What sets Needham’s Obedience apart from all other Trainers ? We have trained 100’s of dogs over the past 10 years. We focus on more than teaching the standard 5 basic commands every dog should know (sit, down, come, stay, place). While we do believe every dog should have an understanding and willingness to follow these standard commands we understand that the dogs ability to do so does not equate that of a well balanced dog. If your dog can maintain a perfect Heel and or perfect leash walking etiquette but yet he tries to kill every animal in sight when taken off leash , is that a “trained” dog ? No. A DOGS ABILITY TO PERFORM FANCY TRICKS DOES NOT MEAN IT IS A WELL BALANCED DOG. We personally know a number of trainers who have personal dogs that perform wonderfully on VIDEO , but yet after the video ends the dog cannot be allowed to socialized with client or other dogs. This is why we are very open about our training process and will quit often train our dogs via FaceBook live where the good, bad, and ugly are not able to be edited. . These During your dogs stay with us they will encounter all the typical busy working family situations your dog will also be placed in at their home. Walks, encountering random dogs, guests coming into the house, children playing , dinner time, visiting other clients homes, visits to public parks, and walks on nature trails. These are just some of the examples of the training scenarios that your dog will be put in. Unlike a training facility or a corporately owned company who out sources their trainers, your dog will be given the proper one on one attention he or she needs. I am ready to Start Training with Needham’s Obedience ! How do I get started ? We have streamlined the process for convenience for owners. Contact us via facebook/email/text/phone call. (info@needhamsobedience.com 281-923-2687) We will send you a link to our paypal account which will enable you to pay a $50 deposit to reserve an opening for upcoming training. The $50 deposit will be deducted from the total price of training. We will send an invoice to you prior to the start of training for the total amount of the training. All fees are due before the start of your dogs training unless paying by cash or check which will be collected the day we pick up or begin training. We are located in Magnolia, Tx, a short drive North West of the Tomball Area. We are approximately 45 minutes from Downtown Houston. What if I do not live in the Houston or surrounding area ? We can still help you with your training needs. We have traveled to Dallas, San Antonio, and even Baton Rouge in order to pick up dogs to train in our Two Week Board and Train Program. We charge a very minimal fee for travel. How old does my dog need to be before I can start training ? “Training” begins the day you bring your puppy home. Although we do not start teaching formal commands until the age of 15 weeks , it is best to work on shaping the dogs behavior the day you bring them home. Dogs of all ages can benefit from obedience training. What shots are required for my dog if I want to Board and Train ? Dogs need proof of Rabies, Distemper, Parvo and Bordetella (kennel cough). Puppies must be 10 days past their final round of distemper/parvo vaccination before we will accept them for boarding. What do I need to send with my dog when starting a Board and Train Program ? All that we ask is that you supply enough food for the entirety of the your dogs stay with us. We have all the leashes, toys, and kennels that will be needed. What if I feel my dog is aggressive towards Humans ? At Needham’s Obedience we have worked with many dogs over the past 10 years that most would consider “aggressive”. However we no longer accept any HUMAN aggressive dogs into our Board and Train Programs. WE WILL ACCEPT HUMAN AGGRESSIVE DOGS INTO OUR IN HOME TRAINING PROGRAMS ONLY. What if I want my Dog trained but I do not have time to train him/her ? Can we tour your facility ? We do not currently allow owners to simply tour our facility. 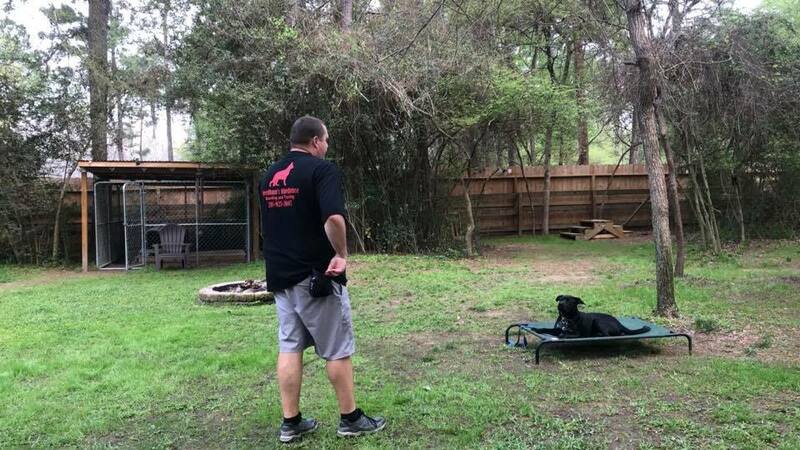 We train dogs out of our own private home which is located on nearly an 1 acre of cleared and wooded yard. We have 100’s of pictures and videos all taken inside and outside of our home. Will my dog listen to me after training and not just the trainer ? This is a very common question, the answer is YES. This is due to the fact that we concentrate on building the relationship between the human and the dog. We are able to capitalize on the dogs natural instinct to look towards the human for direction. We are not only working with your dog, we are also and more importantly working with YOU. We have excelled at our ability to teach owners how to live with their dogs and how to incorporate training in different scenarios of daily life. Do you guarantee your training ? Yes and No, We will guarantee that you will see a significant change in your dog after our training. Since there is no way to guarantee the level of commitment from the owner upon returning of the dog there is no way to guarantee your will dog maintain his or her training. 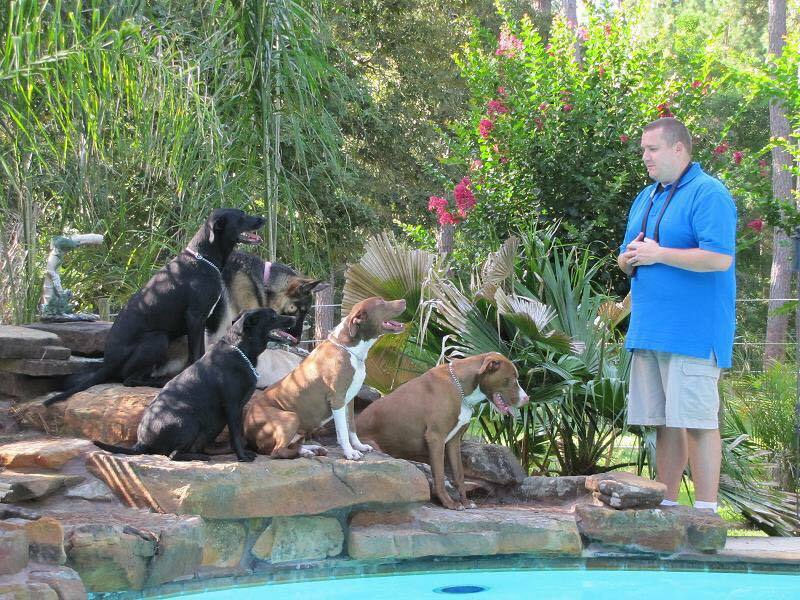 DOG TRAINING IS AN ONGOING PROCESS THAT REQUIRES A LARGE COMMITMENT FROM EVERYONE INVOLVED. There is no quick fix for a dog that has significant behavioral issues. If you come across a trainer that promises to “fix” your dog is simply doing so in order to gain business and is only telling you what you want to hear and not what you NEED to hear. We are upfront and straight forward with our training and the commitment that will be required to maintain a certain level of reliability. Will my dog be “fixed” of any problem behaviors ? Changing the behavior of a dog is an ongoing process which indeed requires owners to change their behavior as well. If you do not change the structure and how you interact with your dog , then he or she will not change their behaviors either. Obedience training will not eliminate a dogs basic needs of attention, activity, trust, and leadership from his or her owners. If owners are not prepared to put in the needed time and are not dedicated to working to continue the training process then the dog will revert back to the same behaviors shortly after returning home. We do however work to address any problem behaviors owners are experiencing. We offer full support to owners even after the completion of any of our training programs. Can I board my Dog with Needham’s Obedience ? Yes boarding is available to all dogs. All dogs enrolled for boarding with us will be kept in individual kennels , allow to socialize with our personal dogs, live in a structured routine , and treated as one of our dogs. We do not simply “babysit” dogs that are with us for boarding. With 10 + years training experience and 100’s of dogs trained , our socializing time with boarded dogs is heavily structured and monitored. We will never have more than 2-3 dogs in our boarding program at one time. We require dogs to be up to date on vaccines, as well as currently be on a flea and tick prevention medicine. Minimum stay of 3 days required. Payment required before boarding date. We reserve the right to refuse service to any dog that we deem a danger or a health risk to ourselves or any dog in our programs.